My next introduction in the Baking with Heritage series is to the superbly talented Renee from Magnolia Days. Magnolia Days encapsulates what I imagine Renee to be: the loveliest, kindest Southern Belle. Born and raised, and to this date living in Georgia, with some jaunts around the world while she was young. I am so happy that social media allows us the luxury of meeting people that otherwise we might have never met in our lifetime. It also introduced me to the charms of Southern Foods and its people that will win your heart over. Renee is an avid baker and a gardener. I adore her Homemade oatmeal Wheat Bread and the heirloom German spaetzle she shared recently. Hello! I'm Renee from Magnolia Days. I am honored to be here on Shulie's beautiful blog. When she asked if I wanted to contribute to her Baking with Heritage series, I jumped at the opportunity. I believe it is important to preserve family heritage through traditions and food. I am half-German and the culture has been a part of my entire life. My dad met my mom when he was stationed in Germany during the Korean war. He fell in love with her and all things German, especially the food. Shulie asked if I had any family bread recipes. Unfortunately none my German family members were or are bread bakers so I didn't have a family recipe to share. I thought of which bread would be a representation of my family. The first one that came to mind is Brötchen which are rolls. They have a hard outside and soft inside. My dad loved them. He really enjoyed the fresh baked ones my uncle would get whenever we visited him in Germany. 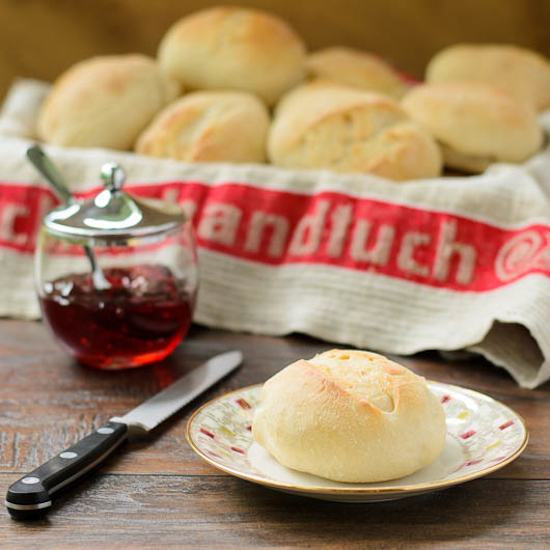 Brötchen is popular all over Germany and is often eaten for breakfast with butter and jam. It is also served with lunch and dinner. Thousands are baked every day and folks like my family get them hot and fresh at the bäckerei (bread bakery not to be confused by konditori which is for sweets). This was my first time making rolls. It was a great learning experience. I channeled my German heritage and did my best. I do need to improve my roll shaping skills. All I need is more practice and I know I'll be making these rolls time and time again. With each batch I will think about my dad and my German family. That is what celebrating heritage is all about. You keep the memories alive and pass them along to future generations. Thank you very much Shulie for inviting me to be a part of your Baking with Heritage series. I cherished each moment of baking the rolls and thinking of my family in the process. Thanks to you I have baked the first of many German breads. In a large bowl, mix the flour, water, and yeast until it is smooth and without lumps. Cover loosely with plastic wrap or aluminum foil and let set on the counter overnight (8 to 24 hours). In the bowl of a stand mixer fitted with a dough hook, add the sponge, 4 1/2 cups flour, water, and yeast. Knead for 8 minutes at a low speed (as recommended by mixer manufacturer when using a dough hook). Add additional flour as needed until the dough "cleans" the sides of the bowl (doesn't stick to sides). Sprinkle the salt over the dough and knead for an additional 3 or 4 minutes. The dough should be smooth but slightly tacky. Adjust with additional water or flour as needed. Shape dough into a ball and place in a large oiled bowl and turn to coat the dough with the oil. Place a damp towel over the bowl and let dough rise at room temperature until doubled, about 2 hours. Turn dough out on a lightly floured surface. Cut dough in half and form each into logs. Cut 12 pieces from each log. Let pieces rest for a few minutes. Shape pieces into balls and place on baking sheets about 2 inches apart. Cover sheets with a damp towel and let rolls rise at room temperature for 1 hour. Position 3 racks equally in the oven. Place a metal pan on the lowest rack and preheat oven to 450 degrees F while the rolls are on the final rise. Use a serrated knife or razor blade to make a small cut or slash on the top of each roll. Place rolls in the oven. Pour 1 cup of water into the pan on the lowest shelf and immediately close oven door. After 2 minutes, spray the sides of the oven with water. Repeat spraying twice in 2 minute intervals. Bake rolls for 15 to 20 minutes turning the baking sheets once for even browning. Transfer rolls wire racks. Enjoy the rolls while they are warm and crispy. Rolls can be frozen. Re-heat frozen rolls in a 375 degree oven for 8 to 10 minutes. So great to find Renee here! Yes, heritage baking is something to take seriously; it´s so incredible how a recipe can travel through generations, and even though the world is completely different, will still give us the same comfort it did to others. Absolutely lovely rolls! Those are pretty Brötchen! They must taste wonderful. But what about the baking? Temp? Time? Ich LIEBE broetchen! TY so much. Good that you picked up on it. I was facing some HTML challenges and in the process it got deleted. I added it back and fixing font as we speak. TY so much, again. Renee blessed are you to be a part of two cultures. Yes, it s indeed important to treasure your heritage recipes and this is a hearty bread that i wouldnt mind eating for breakfast dinner and lunch all it needs is a bowl of warm soup. Shulie this s a fantastic effort to consolidate heritage recipes. Keep the effort going. Thank you Anusha and I really do feel blessed to have both my German and American cultures. These looks delicious!!! Bet they taste amazing! I love fresh baked bread, these rolls look wonderful! I've never heard the name brotchen but I do like what I see here! wonderful buns and I'd loooooooooove to eat one or two (or 3) of them. Thanks Winnie! It is a true love story. Beautiful rolls. I am wondering if these are similar to Kaiser rolls, though they certainly look like they taste better! 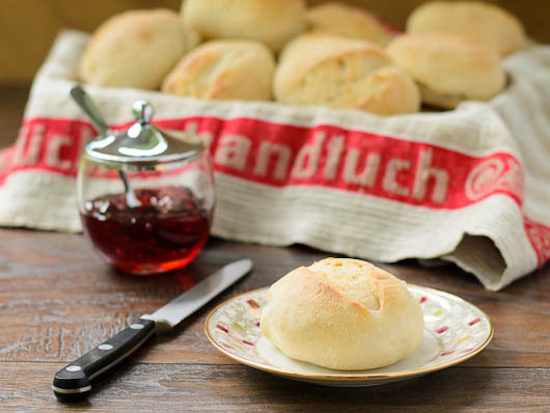 Kaiser rolls are a little larger than these rolls (think about the size of a hamburger bun). They have 5 cuts to make a pattern on the top. A lot of Kaiser rolls have sesame seeds or poppy seeds on top. They are similar in how they have a crusty outside and softer inside. The bread looks yo die for, Shulie. I always admire your breads, egg breads and rolls. You're an accomplished baker, my dear. I think these rolls look just beautiful. I'm shocked you haven't made bread before. You seem like a pro! I love this baking with heritage series, and I'm so glad I was able to read this post tonight. I lovely end to Sunday! 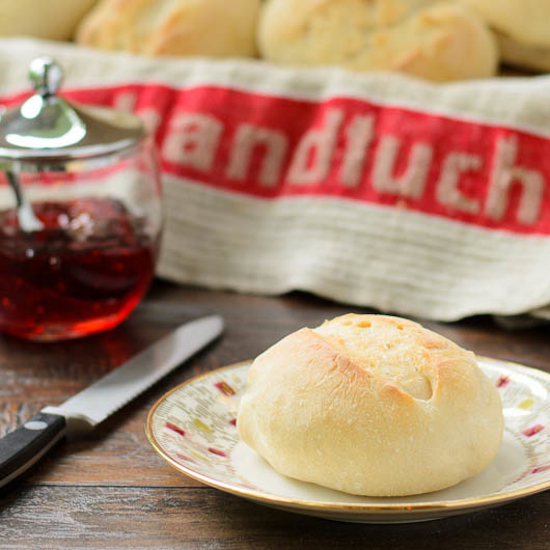 German Brötchen are not easy to achieve in the US, due to the fact that American flour contains much more gluten than European flours. To get the typical fluffy, loose crumb that you can pull out (instead of a chewy French bread type one) try using Italian Tipo 00 flour or pastry flour.